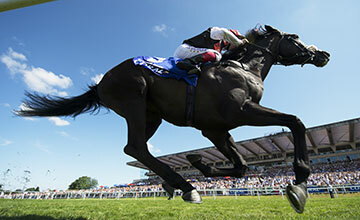 Golden Horn is the best three-year-old thoroughbred in England but will be racing against older horses over one miles, four furlongs for the first time at Ascot on Saturday. The King George VI and Queen Elizabeth Stakes is the mid-summer championship race for middle distance horses in Europe. The race is designed to bring together the best of the classic generation and older horses. Golden Horn is odds-on to follow three Group 1 wins this season with success in the Ascot showpiece. American Pharoah is vying with Golden Horn as potentially the best horse in the world in training. A match between the pair would be a huge attraction but the logistics make such a clash unlikely. In order for the match to take place both owners would need to compromise in terms of distance and surface to make the contest fair. An ideal date but would a few weeks after the Breeder’s Cup. Each horse would be retired to stud after the race so future fatigue would not be an issue. Bovada – Latest odds for the King George. Race fans love match races as they divide opinion and neutrality is out of the question. Everybody has an opinion and a partisan foot in one of the camps. Over the next ten days the best two horses in the world will appear. Golden Horn runs in the King George this weekend and American Pharoah contests the Haskell next Saturday. Both are three-year-old champions unlikely to race at four and in opposition would represent a kind of Ryder Cup of the turf. Before even considering such a race connections of Golden Horn are focusing on Ascot and trying to win the Derby, Eclipse and King George in the same season. Most of the best older middle distance European horses are in the race, except Treve the dual Prix de l’Arc de Triomphe winner who does not act well on the Ascot surface. Telescope was last year’s runner-up but will not appear due to a minor injury issue. The son of Derby winner Galileo was disappointing at Royal Ascot but the race has lost a leading contender. Golden Horn is trained by John Gosden who worked as an assistant in England before moving to California and taking out his training licence in 1979. Over the next ten years he won some of America’s most prestigious races including the Yellow Ribbon Stakes, Ramona Handicap, Santa Anita Handicap and the inaugural Breeders’ Cup mile in 1984 with Royal Heroine. In 1989 he moved back to Newmarket in England winning the Derby for the first time in 1997 with Benny the Dip and again with Golden Horn at Epsom in June. Gosden’s second Derby winner was ridden by Frankie Dettori who was also winning the biggest Flat race in the world for the second time. Dettori famously won seven race at Ascot in 1996 which cost British bookies a fortune. He lost his job with Godolphin after many years of success in 2012 and reacted badly. He was banned from racing for six months for taking cocaine and his decline was summed up by an appearance on a low brow reality show in England. He has got his career back on track thanks to a second association with Gosden and riding for one of the major Qatari racing families. Golden Horn is unbeaten but Gosden believes Saturday’s race will be his toughest test to date. The odds and ratings suggest he should win by several lengths but the opposition will be the strongest he has faced over a distance that is not the optimum. Despite winning the Derby over 12 furlongs the horse’s pedigree suggests he is more effective over two furlongs less. The owner felt his horse would not get the trip in the Derby but decided to make a supplementary entry but it was pure class that got the horse home in the Blue Riband of the turf. Anthony Oppenheimer made that decision to pay the extra fee for a late Derby entry. His family are associated with the De Beers diamond exploration company that was involved in sponsoring the King George for many years so there is a personal connection. He realised a longstanding ambition when winning the Derby and that achievement could be only matched by owning the winner of a race closely linked to his descendents. On form Golden Horn can win the King George on Saturday. Click here for a selection of British odds for the King George.